Nestled in the vast and wide open plains of western North Dakota is Little Missouri State Park. True outdoor enthusiasts may feel as though they have died and gone to heaven when they arrive at this tiny state park. This picturesque park is located along the Little Missouri River, roughly three hours west from two of North Dakota’s biggest cities. Little Missouri State Park is around three and a half hours south west of Minot and three hours north west of the capital city of Bismarck. The town of Killdeer is the nearest population center, located just 17 miles south of the park. This western portion of North Dakota offers visitors a unique combination of wooded areas and northern portions of the Badlands. The formation of the region left behind a little bit of everything for outdoor enthusiasts to enjoy. Those who favor a true outdoor experience will find themselves at home at Little Missouri State Park where vehicles are few and far between, and the preferred methods of transportation are on foot or horseback. • Green Trails: These are the easiest in the park and offer gradual inclines, wide paths, and great panoramic views. • Blue Trails: These trails feature slightly steeper terrains and extend deeper into the park. • Black Trails: The hardest trails at Little Missouri State Park, the Black Trails are much longer and steeper than the other trail systems. They are only for experienced hikers and riders as they often traverse narrow, high ridgelines. Day trippers are not the only ones who will find what they are looking for at Little Missouri State Park. The park also has campsites available for those who wish to spend more time at the park. In keeping with the rustic feel of the park, many of the campsites do not have electrical connections; however there are a few campsites available that do have electrical power. 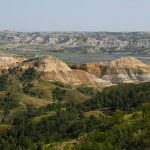 Little Missouri State Park is the perfect destination for those looking to connect with nature and take on the challenge of the rugged Badlands. Those interested in further information should visit the official parks website for North Dakota at www.parkrec.nd.gov. Anyone interested in receiving help in planning their trip or learning about other services should visit Badlands Trail Rides (www.badlandstrailrides.com) for more information.